Technology. It’s both a blessing and the bane of modern culture. While some days I’m tempted to banish all devices from the house and revert to candlelight reading, I can’t ignore the fact that my kids were born into an increasingly digital age—on purpose and for a purpose, as everything is with God’s timing. Therefore, as the parent, I have a responsibility to teach my children how to manage technology wisely. We all have different approaches to screen time, cell phone usage, social media and more. You will do what’s right for your family, and I’ll do what’s right for mine. Yet within our personal convictions, some common principles should apply—particularly for families representing Christ. 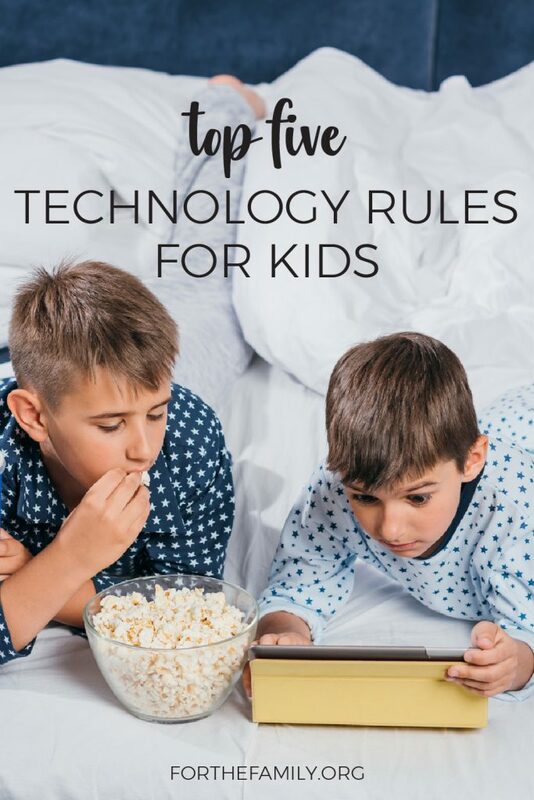 Here are my top five technology rules for kids. I hope you’ll make them your top five, too. 1. Understand the internet is dangerous. Most kids don’t know what they don’t know—and quite frankly, neither do we parents. As a family we need to acknowledge that while the internet provides tons of fun and helpful content, it also has a dark side. So, kids, when Mom and Dad set rules about social media, online research or chat functions, it’s not because we want to make your lives miserable. Just the opposite—we want to protect you from what you may not even realize is lurking. 2. Your device has a bedtime. Why? Because your brain has a bedtime, and your brain jacked up on screen stimulation cannot rest as well as the version of your brain that took a break from the device before lights out. In our house, we have the kids dock their devices in the kitchen by a certain hour every night. That way we know for certain they’re not tempted to sneak an extra text or game past bedtime. And their bodies can power up at the same time as their iPads. 3. Mom and Dad must approve new apps and connections. Before our older daughter can add a new friend to her texting app, she has to ask permission. And before either of our children can add a new app to their device, we must manually approve it. These teachable moments open conversations about appropriate usage and help our daughters build their filters—which will be vital tools for life. 4. Privacy is an earned privilege. My children are still tweens and learning to communicate online in a safe and respectful manner. Just like we all had to be taught how to answer the telephone at a young age, kids need guidance to understand what kind of communication is honoring to God, their friends, and themselves. Even if they don’t have poor intentions, their ignorance can get them into trouble—and so can the kids on the other end of the device. That’s why my husband and I make it clear to our tweens that we will supervise their online activity, and we have a right to monitor their texts, emails or internet history—for their safety and well-being—until they’ve reached an age of internet maturity. And what age is that, exactly? It depends on the child—and the parents. 5. Technology is a reward, not a right. Finally, we parents can set the tone that technology is a welcome part of our lifestyle in moderation—but it doesn’t trump homework, chores, kindness, or any other family expectation. In our house, kids are permitted to play a mobile game or FaceTime a friend, but only after and if. Meaning, after they’ve finished their math worksheet or emptied the dishwasher (in which case tech time is a reward) and only if they’ve demonstrated a good attitude that day. Back talk or bickering is an invitation for Mom to confiscate the beloved iPad. With these five guidelines in place, technology can contribute to your family’s well-being. Above all, let’s never stop praying for wisdom. God gave us our children for such a time as this, and He will surely help us raise them—for His glory—in a hyper-wired world.